Baking classes in Devon for Individuals, Groups and Families. Wonderful food, a warm welcome and a beautiful location. Even if we understand the science, bread making is still a magical process. Using our hands, skill and creativity we can transform simple ingredients into something wonderful, wholesome and delicious. At Manna from Devon we bake as it should be done; with first class ingredients, lots of time and heaps of respect. 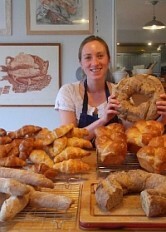 Join one of our bread making classes and you’ll get to grips with the whole process. 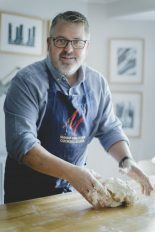 Run by David, a passionate, professional baker, our bread making courses will give you the confidence and enthusiasm to regularly make your daily bread and to explore and experiment with the endless possibilities that an understanding of bread and baking offers. All Baking classes are hands-on, very relaxed and great fun. 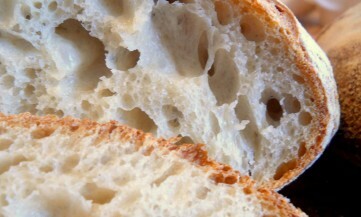 Relax, slowdown and enjoy baking naturally fermented, "sourdough" breads. This class is perfect if you want to improve your skills, explore new techniques and expand your baking repertoire. Take your first steps to becoming a confident and skillful home baker as you learn the fundamentals of bread making. Some of the easiest and yet most versatile breads to make, our Flatbreads class is great fun and very hands-on. All baking classes are limited to 6 places to allow for maximum participation. Lunches and recipe pack included. Baking classes begin at 10:00 and usually finish between 4:00 and 5:00. To book call 01803 752943, Email us, or book online. We support the Real Bread Campaign run by Sustain. The campaign aims to ensure that we do not lose the skills and traditions of bread making and that everyone has access to great, healthy bread. Go here to find out more. For an amazing range of baking equipment for both amatuers and professionals visit Bakery Bits. For the best organic and stone ground flours, milled for the artisan baker and delivered direct to you visit Shipton Mill.